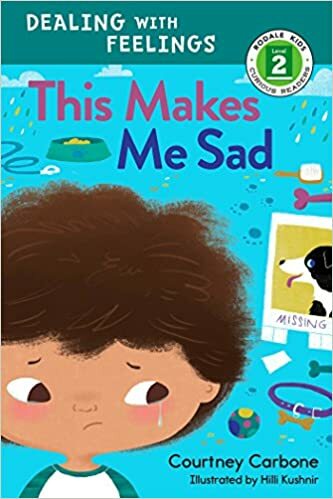 This Makes Me Sad, written by Courtney Carbone and illustrated by Hilli Kushnir, is one of several books in Rodale Kids’ Dealing with Feelings series. This easy reader does a great job teaching emotional literacy through simple sentences that build an accessible and engaging story about a boy and his lost dog. The story is told in the first-person by a little boy who accidentally left the gate on his fence open, which allowed his dog, Kit, to escape. His parents try to reassure him that everything will be okay, but he is anxious and sad. The text often takes a poetic turn, allowing children new and creative ways to visualize their emotions. For instance, the family drives around town unsuccessfully looking for Kit and the young narrator says: “The sun sinks in the sky./ My heart sinks, too.” A simple sentence pairing that eloquently captures and communicates the anxiety felt by the narrator. Later that night, the family is back home, and the narrator looks out a window at a stormy sky and says: “The raindrops look like tears on my window.” His sadness frames everything he sees. The family continues to look for Kit the next day. Seeing other people with their dogs makes the narrator’s insides feel “like ice cream melting in the hot sun.” Carbone prompts children to think expansively about their feelings in order to express their specificity. Later that afternoon, the family looks for Kit in the local animal shelter. He is not there, but the narrator is slightly cheered by the idea of making the animals at the shelter happy by collecting supplies for them. Although keeping busy does not erase his thoughts of Kit, it helps redirect his attention. The family works together to collect supplies and then brings them to the shelter. I love that this book gives children so many ways to articulate their emotions. It also allows for the simultaneous experience and expression of contradictory feelings. The narrator can feel good about collecting and donating objects to the animal shelter even as he feels bad his dog is missing. I also appreciate the subtle rejection of gender stereotypes. It is his father who comforts him when the narrator stares out a rain streaked window with tears streaking his cheeks. Even more, the story features a diverse cast of minor characters and the narrator and his family are racially ambiguous with skin tones that range from medium to light brown. This is a great early reader and I plan on checking out the rest in the series! * I received a review copy of this book and evaluated it in my role as a Cybils Awards Round One Easy Reader/Early Chapter Book Judge.